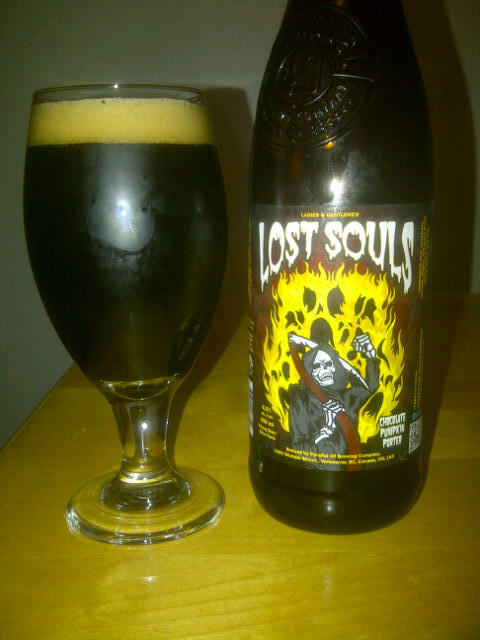 From East Vancouver’s Parallel 49 Brewing comes the “Lost souls (Chocolate Pumpkin Porter)” the very first 650ml sized bottle offered by the brewery. If you are reading this now it may already be sold out as they had no idea how big the demand for this beer would be. They had planned on saving some of this beer for Halloween but decided to release it all right away. If you want to try to find this beer head to the brewery as the tasting room may have a bottle or two left. The beer pours a deep brown/black with a brown head. The smell of the beer is chocolate, pumpkin, malts and coffee. The flavor is complex with coffee, chocolate, malts, ginger and a small hit of pumpkin and hops. The beer has an alcohol content of 6.5%. You will die to try this beer! This beer was also available for tasting at the BC Beer Awards and Harvest Cask Festival 2012. The beer was aged in a cask for a month which brought out more chocolate flavour. I also detected some smokieness. This entry was posted in Porter, Pumpkin Beer and tagged bc, beer, canada, chocolate, coffee, dark, east van, east vancouver, hops, hopy, malt, malts, parallel 49, porter, pumpkin, vancouver. I wonder if I can find this in Colorado?! Sounds delicious.